Alonso was a native of San Antonio, Texas. He was an international figure that represented the United States in many meetings in Latin America. 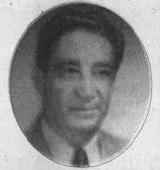 Alonso, a lawyer, devoted his time as LULAC president to the organization of new councils and putting into practice the aims and purposes of LULAC. His administration was responsible for the organization of new councils in South Texas. He and other volunteers traveled at all hours of the day and night, sometimes in inclement weather, doing their organizing work. LULAC News said of such efforts: "LULAC is much indebted to the efforts and sacrifices put forth by these pioneers like Alonso S. Perales. It was this spirit of courage - tenacity and self-sacrifice - during the early history of LULAC that became known as the "LULAC Spirit." At the completion of his term of office, he turned over to his successor and organization with 24 active councils. His greatest task was the defeat of the 'Box Immigration Bill'. This bill would have placed a quota on Mexican immigrants to the United States. Accompanied by Judge J.T. Canales of Brownsville, Texas, and Ben Garza, Alonso went to Washington, D.C. and testified in congressional hearings against this bill. The bill failed to become law. . In 1977 the Alonso S. Perales Elementary School in the Edgewood ISD was dedicated on the west side of San Antonio, and in 1990 the national LULAC convention in Albuquerque paid tribute to him.